A PSNI officer removes a wheelie bin from the rail line at lake St on Monday afternoon. INLM13-243. Two men who were prohibited from entering certain areas of Lurgan had their bans lifted last Wednesday at Craigavon Magistrates Court. They were Pearse Magee (44), Richmount Gardens, Lurgan, and Paul Martin McKerr (47), Belvedere Manor, Lurgan. Both are on bail in relation to public order matters and as part of their conditions Magee was not allowed to enter Lavery Avenue and McKerr was prohibited from the Kilwilkie estate. Applications were made to vary their bail conditions. A police officer told the court that the alleged offences arose out of serious public disorder on Easter Monday in Lurgan. He explained that arrests were made and a special team had been set up to deal with the matter. The officer added that one officer who was seriously hurt in the trouble was still off on sick leave. Deputy District Judge Laura Ievers asked what the change of circumstances was since bail was last set. A solicitor representing McKerr said a brother had recently received a poor health diagnosis and he had a number of relatives in the Kilwilkie area. He added that his client realised the seriousness of these matters but at the same time he wanted to visit his extended family in these trying times. The solicitor said that while on bail McKerr’s conduct had been exemplary and there had been no breaches. Mr Pat Vernon, representing Magee, said his client had been allowed to enter Lavery Avenue until the last bail conditions were set. He said that his client’s partner and three children live in the area and he wanted to spend time with his family. Judge Ievers, referring to McKerr, said that bearing in mind the difficult family circumstances there would no longer be a prohibition in relation to the exclusion zone but all other bail conditions remained in place. She added that the court was going to take a chance with Magee and removed the prohibition on Lavery Avenue. Magee is charged with making an affray and obstructing a constable on March 28 while McKerr is accused of making an affray, assaulting a constable causing her actual bodily harm and obstructing a constable. Three other men charged with offences arising from the same Easter Monday trouble also appeared in court. 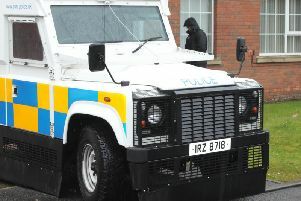 Ciaran Magee (24), Lake Street, Lurgan, is charged with making an affray, assaulting a constable causing her actual bodily harm and criminal damage to a wing mirror of a police land rover. Gerald Majella McConville (53), Kilwilke Road, Lurgan, is accused of assault occasioning actual bodily harm, making an affray and three charges of obstructing a constable. Sean Gerard McConville (32), Kilwilke Road, Lurgan, faces a charge of making and affray and three charges of obstructing a constable. All cases were remanded until September 7 for an update.